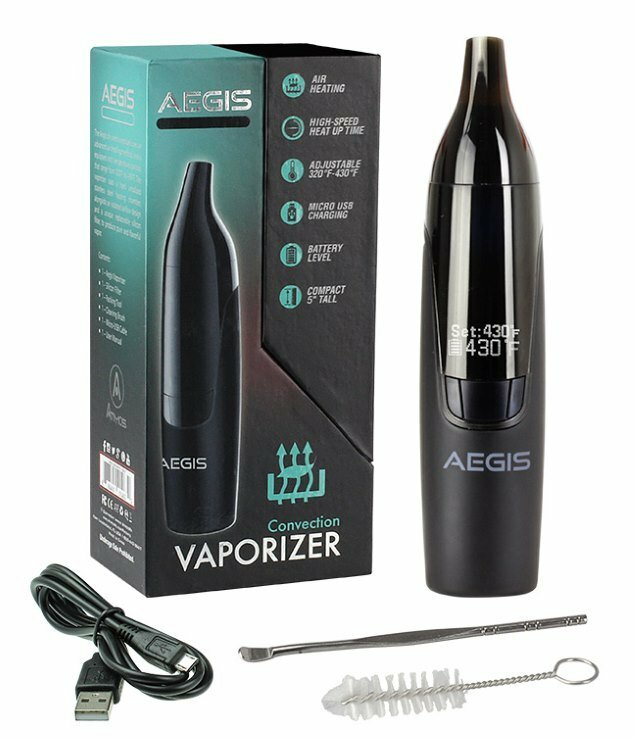 The Aegis vaporizer, thankfully, is not made of goatskin but is made out of what looks like an anodized plastic material that makes it shine in the right light but feels a little more sturdy than most other low-grade plastic vaporizers. The Aegis has a LED display screen occupying most of its front side, and as with most other models like this, the LED screen serves only one specific purpose, and that is to allow for precise temperature control. 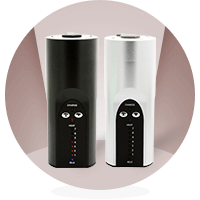 The Atmos Aegis is not a typical looking dry herb vaporizer. It has a strange shape that although odd did fit well in my hand, especially with the rubber coating on the back for an added secure grip. The other bit of strangeness on the Aegis is the nozzle-shaped mouthpiece that sticks out of the center of the device. The mouthpiece looked like a compromise between a stationary and swivel-type where it protrudes but doesn’t swing around all the way. Like a lot of Atmos models, the Aegis looked surprisingly easy to use. It has one power button, and the selector buttons on the side of the power button control the temperature. There’s not a lot of fooling around the Aegis to discover all of its added features; what you see is what you get. The mouthpiece and lid come off easily enough with a quick turn upward. The chamber is wide enough to make loading the Aegis a walk in the park. 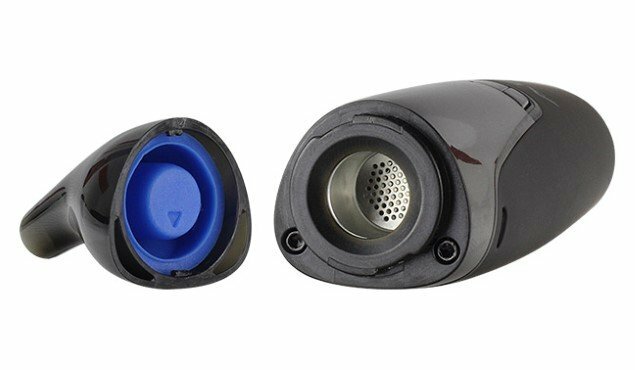 When you remove the mouthpiece to the Aegis, you’ll see that there is a blue, silicone filter directly underneath the mouthpiece and above the chamber. This filter is a heat-guard in case any of the vapor coming out of the device might scald your lips. It was interesting to see this type of attention to detail, as most manufacturers include some type of silicone attachment to protect against overheating with their kits, and not directly built into the machine. Once you have the mouthpiece off, you can access the chamber for quick and easy loading. Grind up your fresh herbs and pack them tightly to allow the convection oven to heat up the herb evenly and equally. Replace the mouthpiece back onto the chamber top and press down to fasten it in place. Click the power button on three times and the Aegis will begin to heat up to the previously set temperature. The Aegis temperature range is between 160C and 240C (320F to 464F) and allows for vapers to find their ideal temperature with the selector buttons on either side of the power button. Turn the device on and select your preferred temperature. Once you have set your temperature, the Aegis will begin to heat up to reach your preferred setting. I found that a mid-range temperature, somewhere between 392F and 400F is the perfect temperature to generate enough vapor without the device or your vapor getting overheated. The Aegis was a dream to pull off of for great vapor clouds. It was easy to draw from, and the low to mid-range temperatures were the best for a smoother flavor. The higher you went, temperature-wise, also meant that the vapor got hotter and more unpleasant to taste. The Mig Vapor Matrix has most in common with something like the Aegis since they both have ceramic heating chambers, precise temperature controls and are both rather hefty to hold. The Mig Vapor Matrix has a ten-second cut-off feature that the Aegis does not have since to turn off the Aegis you have to click the power button three times. The Matrix is also a multi-media platform, meaning that you can use it with herbs, oils, and waxes. And last, but not least, the Matrix and the Aegis are almost the same price, with the Matrix being a tad more expensive at $150 compared to the Aegis at $130. So, with that said, for all the Matrix offers in terms of quality build and 3-in-1 vaping, the Matrix takes it by a long shot. Precise temperature control is always a good thing to have to placate the most die-hard of vapers. It completely customizes the experience and allows for exact specifications for that personal vape experience. The temperature range was wide enough on the Aegis to make temperature control matter. Making a device easy to use can be a tricky proposition for some manufacturers. You want new vapers to be able to easily use the machine but also deliver great quality vapor for the veterans, so in that respect, I think that Atmos achieved those two goals with the Aegis. The Aegis is a bit hefty, but not so much that it becomes cumbersome. I did walk around with it for a few days, and I forgot that I even had it in my jacket pocket. The battery life might not make it the most ideal for all day use, but with you charging on hand, you can take the Aegis anywhere. Overheating is one reason why temperature control is so essential. A too-hot pre-set temperature can only be remedied by going back down to the last pre-set, while somewhere in between is that perfect degree. I did feel the vapor getting a little hotter when testing the limits of the Aegis. The heat-guard underneath the mouthpiece didn’t exactly do what it was supposed to do since it just added to the detriment of the flavor. On the mid-range temperatures, the flavor and vapor production was equally good. Only when I started to fly closer to the proverbial sun, did I get some nasty burn-hits and vapor that was too intense. While I wouldn’t give the Aegis a full recommendation, I would still recommend it over the Thermo DW, but the less said about that, the better. The Pillar, I thought, was a better performing device since it hit high temperatures without compromising flavor or vapor quality, while the Aegis had trouble balancing both. Still, Atmos had stepped up their game from previous, weak entries and look like they are finally hitting their stride when it comes to producing portable, flavorful and powerful dry herb devices. I give the Atmos Aegis a protective 8/10. Usable straight out of the box, the Apollo Ohm Go Vaping Kit is an ideal choice for beginning vapers. This review explores the pros and cons of the kit.